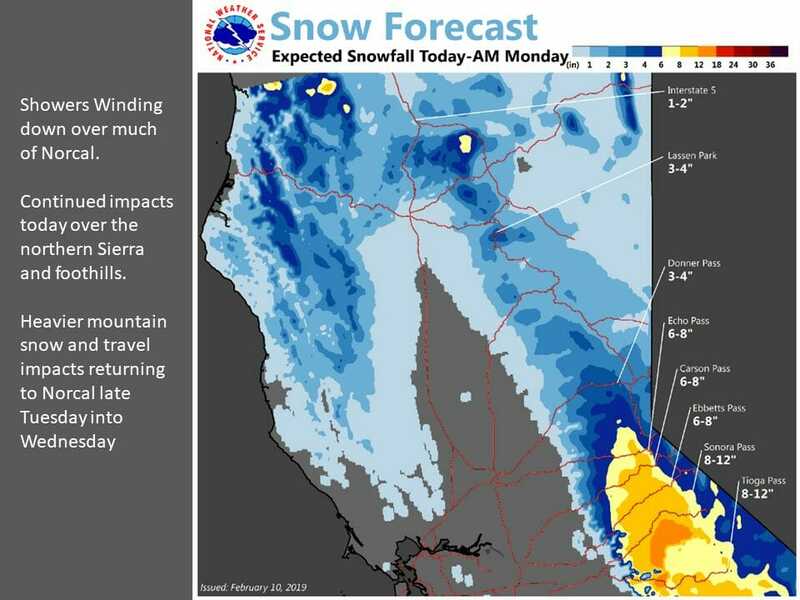 February 10, 2019 – Mountain and foothill snow today into this evening over northern Sierra with scattered showers elsewhere. 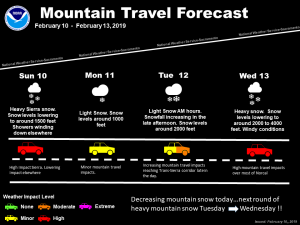 Mountain travel impacts continuing. Light rain and snow north of about interstate 80 early this week. Heavier rain and mountain snow mid week with lighter showers going in to next weekend. Satellite imagery shows a cold frontal band currently along a Tahoe to Bay Area line dropping southward as a cold upper low now centered over central Oregon shifts to the southeast. Radar and surface observation data indicates the snow level is around 2000 feet over the northern Sierra foothills/Motherlode region. Cold air behind the front farther to the north causing still lower snow levels. As the upper low moves southeast into the Great Basin today, showers will continue over the northern forecast area but precipitation amounts should remain fairly small. 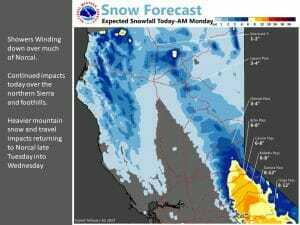 Therefore, even though the Redding area could see some snow due to the very cold air, impacts from snow should be minimal there. The cold airmass will keep daytime high temperatures on the cool side and several to as much as 10 degrees below normal. Showers will diminish over the Sierra this evening as the upper low shifts east. Meanwhile, another cold low pushing through the Pacific Northwest will bring a threat of precipitation to the northern CWA. Subsequent shortwave systems will bring a continued threat of precipitation mainly to the northern forecast area Monday but a somewhat flat upper ridge will likely keep precipitation amounts fairly light. This upper ridge is forecast to shift eastward late Tuesday and Wednesday allowing a Pacific frontal system to move onshore. This will bring heavier precipitation to the north state late Tuesday into Wednesday. This system, originating in the Gulf of Alaska rather than western Canada will be a little warmer than the current system but snow levels are still likely to drop into the upper foothills. 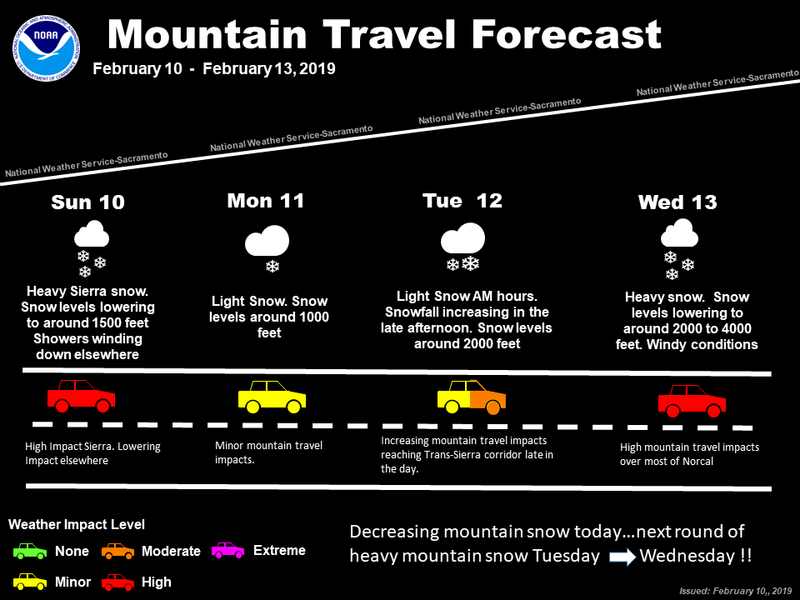 Therefore, look for another round of impactful mountain snow along with gusty winds late next Tuesday into Wednesday. Still lots of uncertainty with the details of the late-week weather, but the cold and unsettled pattern will likely continue with intermittent showers and low snow levels. Next articleCalifornia made it hard to avoid vaccinating kids. Medical waivers have tripled. Now what?